US Federal Maritime Commission (FMC) licensed freight forwarder. International Air Transport Association (IATA) certified and Indirect Air Carrier (IAC). Transportation Security Administration (TSA) Certified Cargo Screening Facility (CCSF). Directorate of Defense Trade Controls (DDTC) registered and management of US-licensed ITAR, US Military, US Department of State and US Department of Commerce approved shipments. With offices in 12 countries and a network of experienced and carefully selected agents across the globe, MEBS offers a unique advantage in the freight forwarding market. Our in-country staff ensures a higher level of service and quick resolution of any obstacles that may arise during customs clearance or port-to-door delivery. 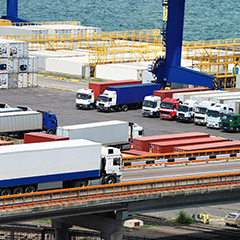 We work closely with US and foreign flag air and ocean carriers, as well as truckers worldwide in order to provide MEBS clients with the lowest possible rates at the best service levels.